Tonight I watched the new movie "Dear John." The love story kind of tugged at my hear strings. But the story between father and son pulled so hard those old strings threatened to snap right in half. My dad is amazing. More so than even explainable. My dad had a choice, a choice to be dad...and he took it. Not many people would. In fact, he took it when someone else had declined the opportunity. Someone who shouldn't have had so much of a choice. Health-wise my dad is a walking miracle everyday. God's hand is in everything, guides, and directs every detail of what happens here. This, my family can say for certain. There is no other explanation to my dad's health. I wish I could expound on how amazing my dad is. He has been through so much, probably Hell and back a couple times. I regret to say, I put him there a couple times. When I was little I used to open and close my scriptures over and over again, hoping that they would look like my dad's. He loves God, and his family, and to him the two go hand in hand. I've taken my dad for granted way too many times. He's never neglected me, or my needs. I am selfish and don't deserve to be forgiven as many times as he has forgiven. There is a Brad Paisley song my roommate showed me the other day that reminded me so much of my dad, I bawled through the whole thing. I literally am everything I am because he CHOSE to love me. Words literally can not adequately describe the blessings he has brought, and continually brings to my life. I've always thought of my dad when I hear this song by Celine Dion. Today it's especially hitting just the right notes for what I wish I could express. Darn you girl, made me cry too. That picture of Lance the missionary is awesome though. He is a great man. I consider him a part of my family too. What a sweet post. I think he's pretty terrific too (in an ocd way of course). He is one of the most Christlike people I know. I so enjoyed reading your blog. Your dad is wonderful, and you are too. I'm thankful that I know you both. Did you HAVE to make me cry? You are the best daughter he could have ever hoped for so don't be hard on yourself. If you hadn't tried his patience a time or two then you wouldn't really know just how much he's been there for you. (the rhyme was NOT on purpose) Yes, he's a great dad and YOU my friend are one lucky girl. And he one lucky/blessed dad. I always knew he was smart. Oh! 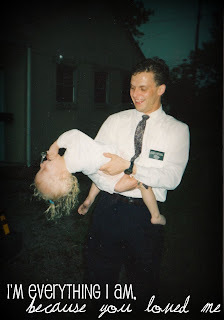 And not every daughter has a photo of herself with her dad as a missionary. That is so COOL!!!! !